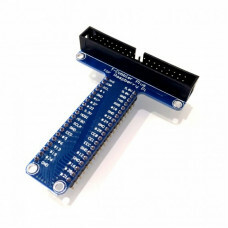 The T-Cobbler is an add on prototyping board specifically designed for the Pi 3, 2 Model B, B+ & Zero accessories that can break out all those tasty power, GPIO, I2C and SPI pins from the 40-pin header onto a solderless breadboard. This set will make "cobbling together" prototypes with the Pi super easy. You can plug the 40-pin GPIO cable between the Pi computer and the T-Cobbler breakout. The T-Cobbler can plug into any solder-less breadboard. Dimensions: 72 x 59 x 13 (LxWxH) mm. HDMI to VGA Converter with Audio for Raspberry Pi..
Raspberry PI 3 Case Enclosure Official..